Lee Bradbury praised the spirit and work ethic of the Hawks after they beat Aldershot Town 2-1 in the live televised clash at Westleigh Park. 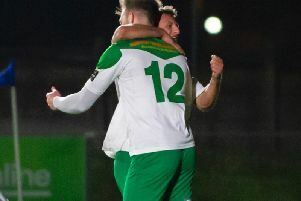 The determined hosts recorded their first home success in the National League. Boss Bradbury said: ‘It was a big, big win for us. ‘We showed a lot of spirit and a lot of graft. ‘The big difference was we didn't make many mistakes, if any. Plus we were better in front of goal. ‘We scored two goals straight off the training ground and that is always nice. ‘At times we came under pressure and have to expect that against full-time teams. ‘We remained disciplined, organised and defended very well. ‘We deserved the win against an established, expansive good footballing side. In the home line-up Dan Strugnell and Ryan Woodford replaced injured pair Jordan Rose and Mike Carter. Bradbury reverted back to two up front with summer arrival Alfie Pavey replacing Bradley Tarbuck. With an attendance of 1,989 at Westleigh Park both sets of fans were producing a terrific atmosphere in front of the live television cameras. The first chance fell to the Shots when Scott Rendell headed a clear far-post chance over the top. It was the visitors who looked the sharper in the opening 20 minutes creating the better chances. The home side were dealt a big blow when captain Brian Stock limped off to be replaced by Andreas Robinson. On 27 minutes the Hawks took the lead against the run of play. A foul on Wes Fogden resulted in a free-kick right on the edge of the Shots area. The ball was played to Theo Lewis and his low shot squeezed past goalkeeper Jake Cole into the net. Before half-time the Hawks also lost Fogden to injury to be replaced by Ibra Sekajja. Aldershot pressed hard for an equaliser in the second half but to their credit the Hawks back four, superbly marshalled by Paul Robinson, held out. Rory Williams relieved the pressure with a terrific break from inside his own half. Sekajja also sent a 20-yard shot wide of the post as the game continued in a lively fashion. Both Robinson and Ryan Woodford went close to extending the lead from corners. The visitors looked increasingly threatening and the Hawks had to weather intense pressure. Seven minutes from the end Robinson made it 2-0. Williams delivered a deep free-kick and when the ball was sent back across goal the defender was on hand to head in from point-blank range. A last-minute Scott Rendell goal led to a nervous ending but the Hawks had done enough.